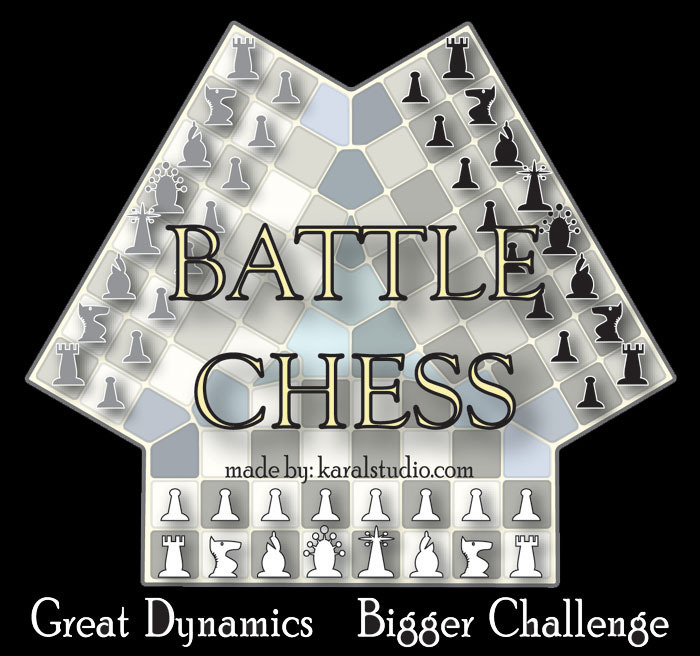 Karal Studio Battle Chess, 3 player game. Challenge of intellect and social dynamics, played here on level ground. Only one will ultimatly score. As a spectator in many great games, I had often noticed much more of a games potential I could see due to my unattached viewpoint. Caught in the intensity of it all, it is difficult to withhold unsolicited suggestions. My interference would cause much bickering and how I wished to be allowed to play on the board with them too. This got me thinking, how about a board for three opponents? By opening up the area for a third complement of men, the 3 player battle begins! To win it is necessary to create alliances then commit treason. Be prepared to experience an intense game. New dynamics of play rolls into action, greatly expanding ones challenge in several directions. The application of the 3 opponent scenario. The movement potentials of all the pieces are enhanced. The discovery of new strategic sequences. It should be noted that some traditional strategy is of little use here for it is surpassed by superior movements of the powerful queens and bishops. This is a group game so the feeling of one comes to life with Battle chess. The silent concentration of one mind pitted against another is shattered as one struggles with friend and foe, often with humorous outbursts and loud curses that surely follows. 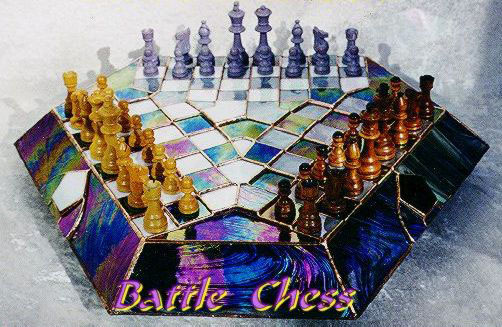 Battle Chess may be played by 2 opponents only. Known as a Skirmish, it is just as exciting and there is far more room to move on the 92 square board.